What are some of the patterns in Asia with regards to fixing and policy rates? What have we found through our rates models? When deciphering EM rates, we look at 14 rate markets across Asia, Latin America (LatAm) and EEMEA, and highlight the evolution of benchmark policy rates and analyze their relationship with IRS/CCS fixings through different monetary policy regimes by looking at seasonal factors and possible leads or lags in the fixing to potential rate actions. We also look at the effects of sharp domestic equity and foreign exchange (FX) moves on the fixing. From this analysis of EM rates markets, IRS/CCS fixings are observed to broadly track benchmark policy rates, but there are factors – mainly seen in Asia rates markets – that could create occasional divergences. While relationships between the fixing and policy rates during rate cuts, hikes and neutral monetary policy regimes vary, there are noticeable patterns in Asia. In LatAm and EEMEA, we have observed broad stability in the fixing and policy rate spreads, with most divergences temporary and driven by significant market volatility and/or seasonal factors such as tax payment periods and popular holidays. 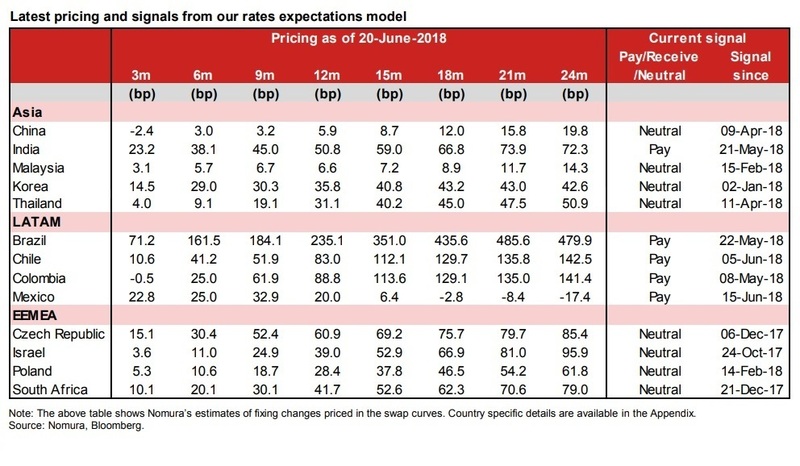 Regarding potential rate hikes and cuts, the fixings broadly move on the day the rates action is delivered but there is some evidence – in Korea, Thailand, Czech Republic, Israel, Poland and South Africa – that fixings can start moving lower or higher into the rate cut or hike event. In addition, we tested the predictive power of our model and found that momentum strategies (pay rates when markets are pricing in hikes, receive when markets pricing in cuts) perform better than mean reversion strategies. There is also evidence that central banks tend to meet market expectations at policy meetings. Other factors affecting the fixing are local equity/FX moves, independent of policy expectations. For instance, a 4% move in equity markets could influence fixings in China, Korea, Colombia and Mexico. However, in EEMEA, significant, negative equity/FX moves had broader impacts on fixings. Finally, when testing the relevance of the rates expectation models in key markets such as China, India, Korea, Chile, Mexico, Czech Republic and South Africa, it was found that our model is broadly able to predict the direction of 1Y swap rates with a three-month lead, independent of the US Fed cycle. Overall, the momentum strategy worked best in Malaysia, Korea, South Africa, and Chile. In India, Czech Republic and to an extent China, momentum strategies performed better for receivers while, in Mexico and South Africa, the most profitable/reliable signals were for higher rates and payers. One exception is Israel, where a mean-reversion strategy performed slightly better than a momentum strategy. For more insights on deciphering EM rate expectations, read here.